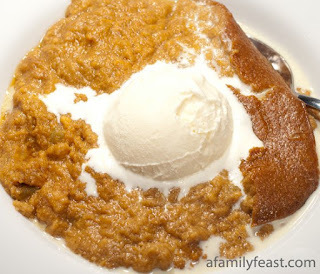 INDIAN PUDDING: A baked pudding made from cornmeal, molasses, milk, sugar, ginger, and other spices. ICE CREAM: A frozen, sweet dessert made from milk, cream, sugar and sugar with flavors or fruit sometimes added. Your Indian Pudding looks delicious. I've never eaten any because I am not a pudding fan, but looking at your picture, I may change my mind and try next time. Hi Pat! I've not eaten it before either but it DOES look yummy!